However, these superb 10 did make it. Spike Lee’s best film since DO THE RIGHT THING finds a pioneering black policeman in the late 1970s taking on the Ku Klux Klan. 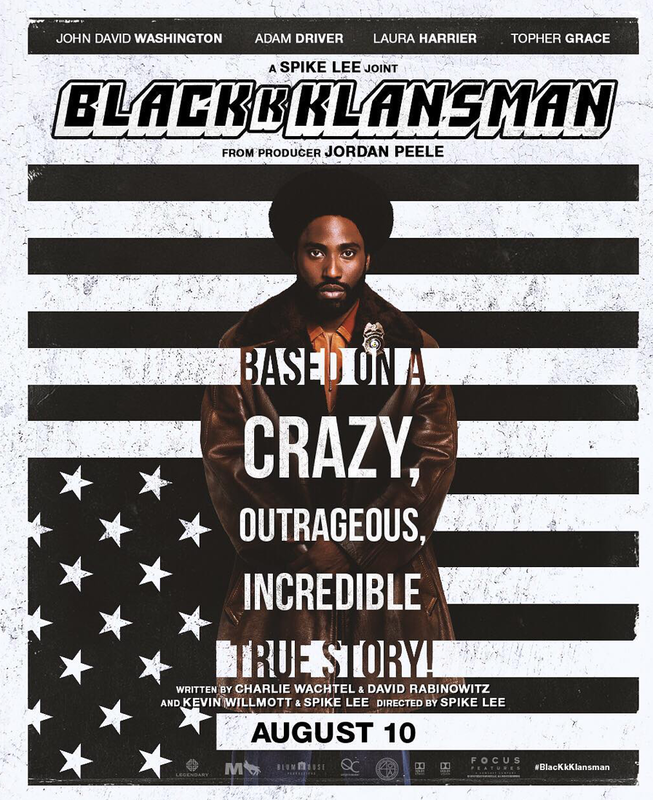 Detective Ron Stallworth (John David Washington) pretends to be a white nationalist on the phone talking to various Klansmen to uncover their terrorist acts while his white co-worker Detective Flip Zimmerman (Adam Driver) goes undercover to expose them even more. BLACKKKLANSMAN is a gripping and tense period piece, all the more amazing considering its tone is that of a dark comedy, reflecting the realization that the story is so ludicrous it could only be true. Lee’s film also, not surprisingly, is a searing commentary on our modern world and its continued embrace of bigotry. One would think we’d be beyond such white nationalist thinking in western countries but look at the surge of racial hostility across Europe, as well as our American president who sows the seeds of prejudice and hatred at every turn. The film is not only a brilliant entertainment, one that stays with you, but it’s an alarm bell ringing out for our better angels to wake the hell up. The most impressive first film this year was Bo Burnham’s EIGHTH GRADE. A coming-of-age film that could almost be a companion piece for last year’s LADY BIRD (my pick for 2017’s best), Burnham’s film tells the story of Kayla Day (Elsie Fisher), an introverted and insecure junior high kid on the crest of adulthood, trying to get through each day with the minimum amount of uncertainty and anxiety. Told in episodic fashion, nothing much happens in the story, and yet everything happens that is important to modern youth. Parties, texting, cliques, tests, boys, friends, privacy, fashion, v-blogs, and acne – they are all a part of Kayla’s daily dysfunction. And her battle to overcome her anxieties is both hilarious and heartbreaking. Few examinations of children are as smart or as compassionate as this one. Can love conquer all? That is one of the central questions at play in Barry Jenkins’ sensitive adaptation of James Baldwin’s novel IF BEALE STREET COULD TALK. A young black couple is in love, but little will come easy for Tish (Kiki Layne) and Fonny (Stephan James). An unexpected pregnancy, family rejection, harsh economic realities of Harlem, and racist police will all create obstacles for their relationship to overcome. While a filmmaker like Jenkins never sugarcoats the world, in his central characters here he finds plenty of hope as long as they have each other. It’s a spiritual and political film about love, prejudice and soul mates. Paul Schrader has written some of cinema’s finest scripts (TAXI DRIVER, RAGING BULL) and at 71, the legendary screenwriter wrote and directed perhaps his finest. The world is taking a toll on Pastor Toller (Ethan Hawke). He’s losing faith as corruption ruins religion, man ruins the planet, and a terminal disease his ruining his body. Toller decides to keep a journal of his remaining days and little he finds gives him reason to pray. It’s riveting from its first seconds to its last, and here another filmmaker is asking in 2018 if humanity can get its act together. Toller doesn’t believe so, but even in the darkest recesses of Schrader’s imagination, it appears he still is a true believer in redemption. What does an artist do when people stop paying attention? Reinvention has never been more outrageous as it is here when biographer Lee Israel starts faking celebrity letters to earn money to pay the rent and get her sick cat proper medical attention. Melissa McCarthy makes the criminality of Israel not only understandable but heartbreaking. And, as her lost soul of a drinking buddy and co-conspirator, Richard E. Grant deserves an Academy Award for making his cad so sympathetic too. In an era with far too many tentpoles, sequels, and superheroes, it’s nice to see such a small film as this gem, directed by Marielle Heller, show that a good story with fascinating characters beats wall-to-wall CGI any day of the week. Two women fight like cats and dogs trying to curry favor with Queen Anne (Olivia Colman) during the early 18th century. You’d think it would be enough for Lady Sarah (Rachel Weisz) and Abigail (Emma Stone) to be amongst the one-percent in the queen’s court, but their selfishness and duplicitous ways know no bounds. The three actresses in Yorgos Lanthimos’ darkest of dark comedies all do extraordinary work, as do all the below-the-line talents too. Absolute power corrupts absolutely, as the saying goes, and indeed, the ruling class has never looked more absurd than they do here. Alfonso Cuaron’s deeply personal and detailed film about his childhood in 1970’s Mexico City is one of the most beautiful, dramatic, and devastating portraits of the working class ever put on film. Cleo (Yalitza Aparicio) displays quiet strength and immovable devotion to the doctor’s family she tends as a housekeeper. Much will befall the family, and her as well, but Cleo manages to be a rock for all of them, a woman who stoically puts their needs first at each moment. It’s a character study of a woman who says nary a word yet speaks volumes with her perseverance and ability to manage whatever comes her way. Look for this to win Best Foreign Language Film at the Oscars in a walk, and likely give A STAR IS BORN and whatever other American-made movies are up for Best Picture the stiffest of competition. With little hoopla or fanfare, this animated superhero swept into town and dazzled critics and audiences alike. SPIDER-MAN: INTO THE SPIDER-VERSE is not only the best Spider-man film to date, but it’s one of the top five superhero movies ever made. That’s how good it is. Mixed race teen takes over as Spider-man after Peter Parker is killed, but a rip in the time continuum not only brings the original back but additional Spidey’s from alternate universes. The jubilant and vivid animation mixes 3D and 2D, not to mention styles that range from comic panels to pop art to art deco. Visually, it will blow you away, but the story and characters are utterly as extraordinary. It may have taken three directors to bring this to the screen – Bob Persichetti, Peter Ramsay, and Rodney Rothman – but boy, did they deliver the goods. My spider senses are still tingling! This truly has been a banner year for films showcasing the African-American experience, and none is more prescient that THE HATE U GIVE. Amandla Stenberg gives a wonderfully intense performance as Starr, a teenage girl who may come from the poor section of the city but manages good enough grades to commute to a prestigious private high school. One day, her worlds collide when she hitches a ride with a friend from her neighborhood, and the black teen is shot dead by a white policeman during a traffic violation. It’s a complex story, one that director George Tillman Jr. handles with great care and time. (The film clocks in at 2 hours and 13 minutes, and it needs every second of it.) His cast is utterly sublime and should be up for a SAG Ensemble Award. 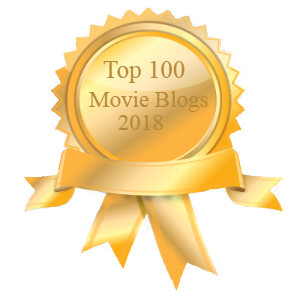 Hopefully, more people will see it and give it due in the awards cycle and video rentals. How is it possible that six films into the franchise, the Christopher McQuarrie directed MISSION IMPOSSIBLE FALLOUT is its best one yet? Is it because this movie knows how to put characters in adventures that are compelling and exciting? Is it because Tom Cruise, now in his mid-50s, still does almost all of his own stunt work and it’s really him flying helicopters, jumping over rooftops, and suspended from midair on dangling ropes thousands of feet above the ground? Is it because despite the MI films being star vehicles, they somehow always manage to find great supporting roles for six to seven others? Yes, yes, and yes. Bring on the seventh, I say, as we now know it’s virtually impossible to screw this series up.